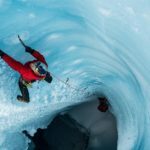 UPDATE: May 3rd 2017 – After publishing this review, the folks at Breakthrough Photography reached out to me to let me know that they just launched two additional sizes in their quick release plate lineup: an 85mm plate designed for the foot of longer zoom lenses or super telephoto lenses, and a smaller 40mm plate for mirrorless cameras and point and shoot cameras. 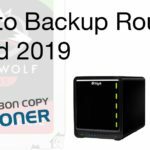 They offered to send these additional plates to me so that I could add photos to this review, which has now been completed. 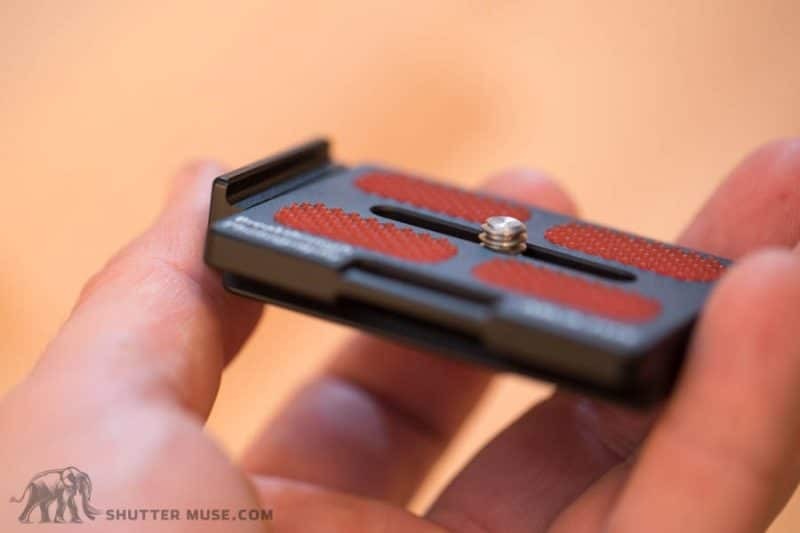 Hopefully nobody is still screwing their cameras directly onto a 1/4″- 20 stud on their tripod’s ball head? 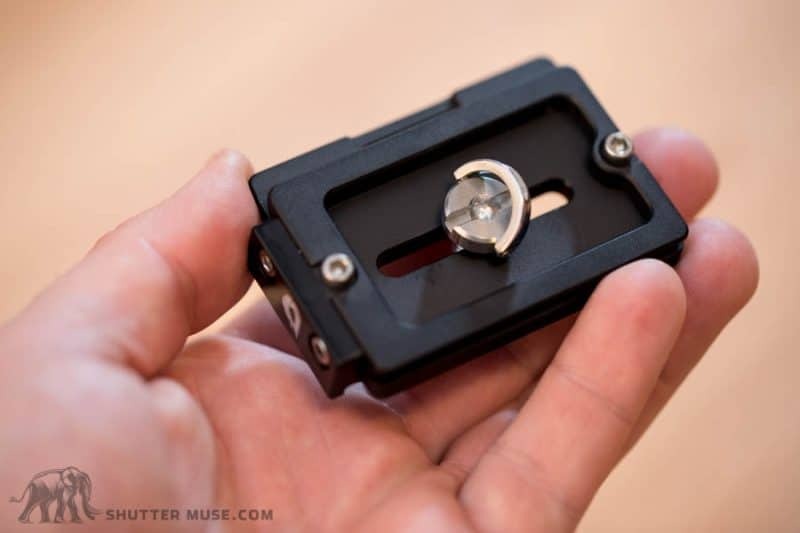 For speed and simplicity, a quick-release clamp is a must-have item for any discerning photographer. 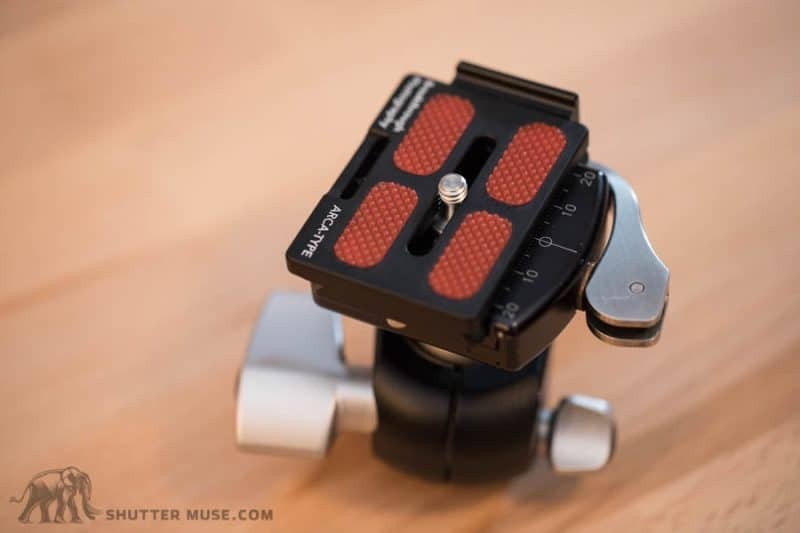 Using a QR clamp means that you also need to have a compatible QR plate on your camera, or whatever else you are trying to mount onto the ball head. 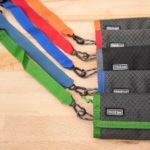 Some manufacturers like Really Right Stuff make camera and lens-specific plates, which is a nice option to have if your budget isn’t restricted, but sometimes you just need to have a cheaper solution, or a universal plate that you can carry around to use for a variety of different cameras and lenses. 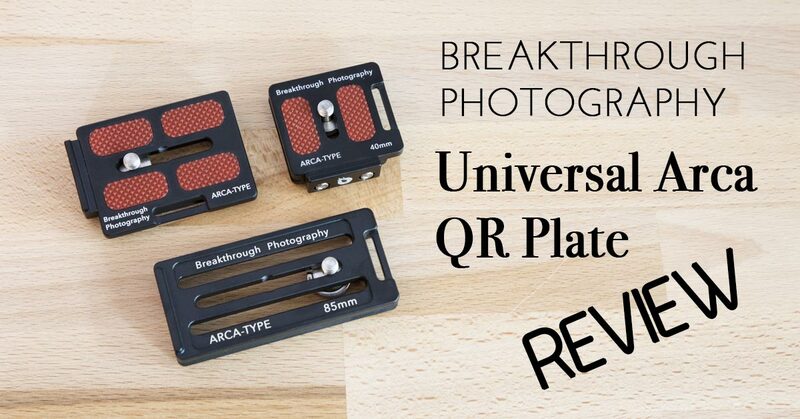 The Breakthrough Photography Universal Arca-type QR plate is just such an item, and it’s only $15. 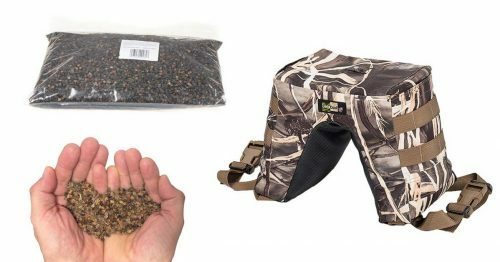 I mention the price right away because it’s actually one of the cheapest solutions of this type on the market. I’ve been impressed by the quality of Breakthrough Photography’s other products in the past, and I needed a spare QR plate to have around for emergencies, so I hopped on the B&H Photo website and purchased my 60mm plate (85mm and 40mm also available). As with all of their products, it ships packaged nicely in a little plastic case with a branded lens cloth, and it instantly feels like more than a $15 product before you’ve even unpacked it. 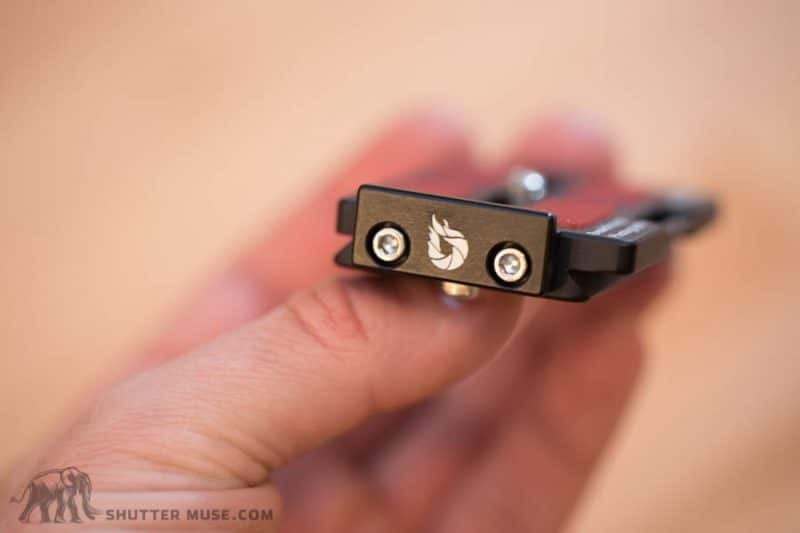 Once you take a closer look, you’ll find a that the 1/4″-20 stud doesn’t need a coin to tighten it, it actually has a clip up D-ring on it. Nice touch! 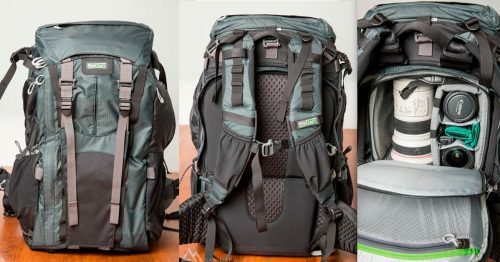 It also has a hole for passing a camera strap through it, two slide stop screws on the bottom and a restraining lip on one end which is removable. This lip is extremely useful for preventing the plate from rotating under large torque. 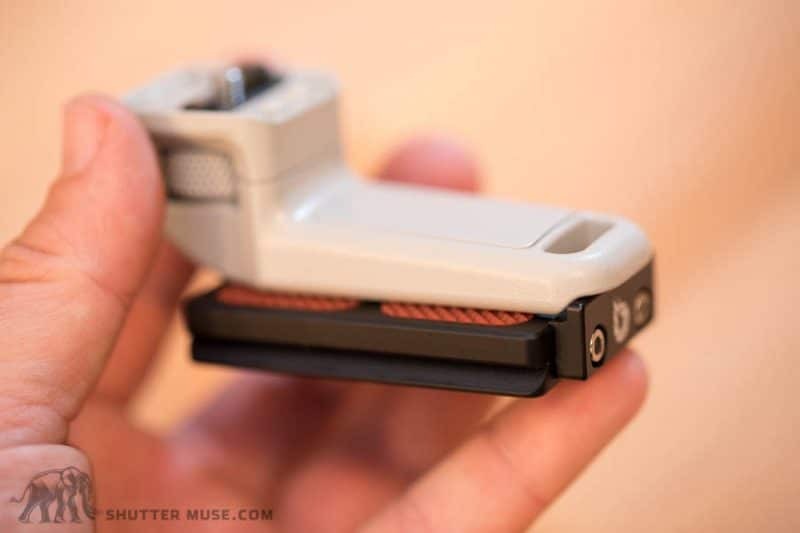 I realize that there’s not a whole lot you can say about something as simple as a quick-release plate, and in all honestly I wouldn’t normally take the time to review something quite so small and simple, but then again, I never expected to find something so simple, that stood out for the crowd quite so much. I’ve spent $40+ on similar plates in past years, so this is one of the best little bargains I’ve ever seen. 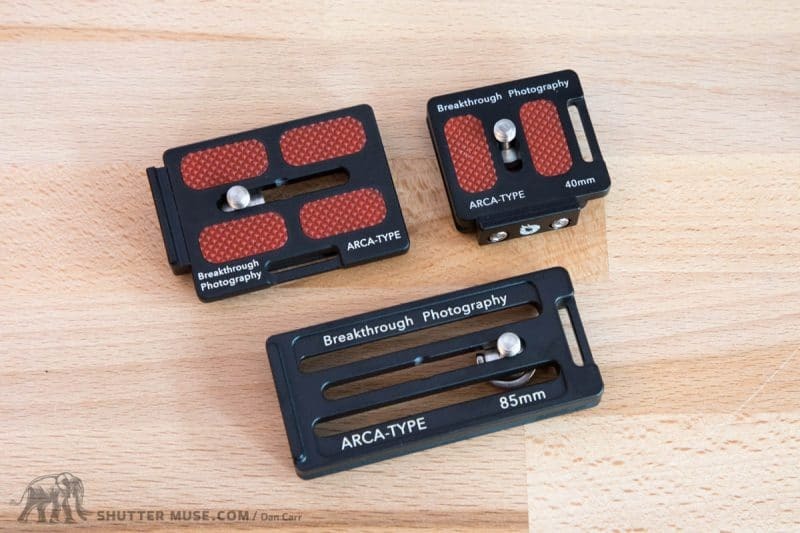 Grab a couple and put one in each camera bag so you never have that forgotten tripod plate moment ever again! 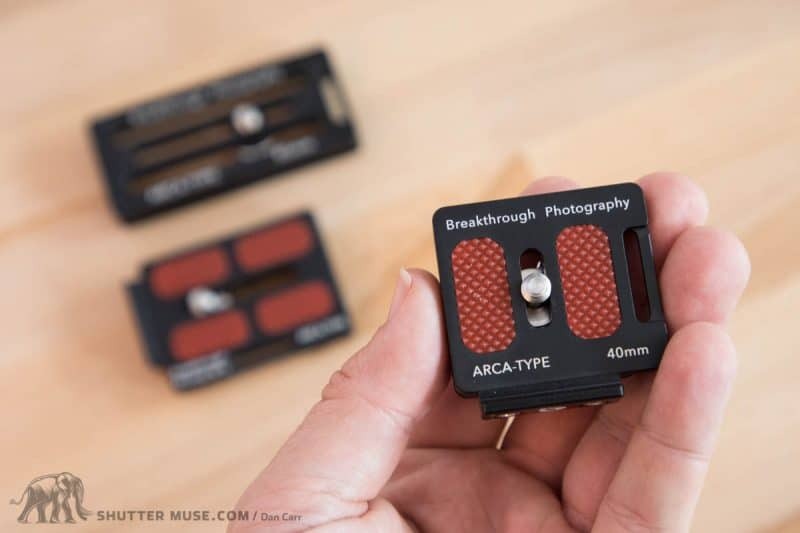 The Breakthrough Photography Arca-type plates are available i three different sizes: 40mm, 60mm and 85mm. The 40mm size is nice for small mirrorless cameras, the 60mm is great for a DSLR and the 85mm is the one you want for the foot of your 70-200 f/2.8 and a 300mm f/2.8 or other such super telephoto lenses. If, as I have suggested, you just keep one in your kit for emergencies as a spare, the 60mm size that I initially purchased myself is definitely a good middle ground and can be used on both smaller cameras and lager lenses too. This product really left me scratching my head because I can’t quite figure out why it’s so cheap. $15 is an absolute steal, in fact I’d still be recommending it if it was twice the price. Perhaps Breakthrough Photography are using it as some sort loss-leader to introduce people to their brand? Even that seems odd though, as the Arca QR plate doesn’t really have much to do with their main products which are photographic filters. 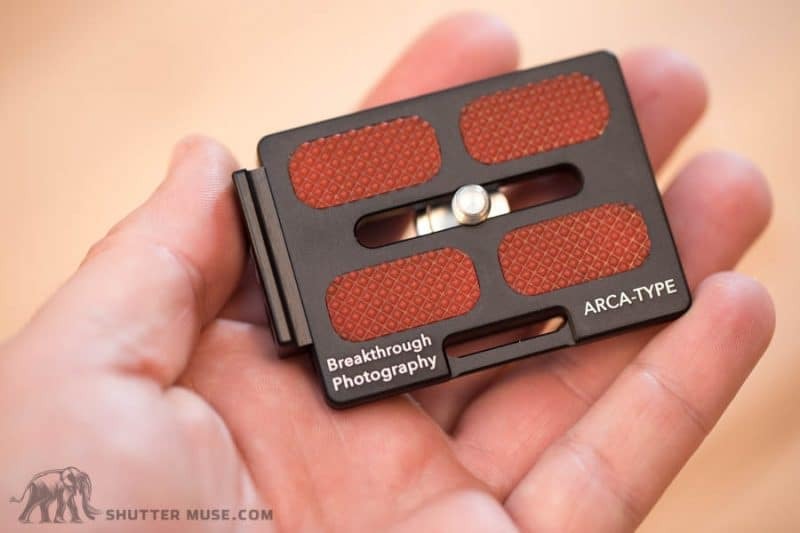 If you have a ballhead that takes the Arca-type plates, this is a simply a brilliant option. 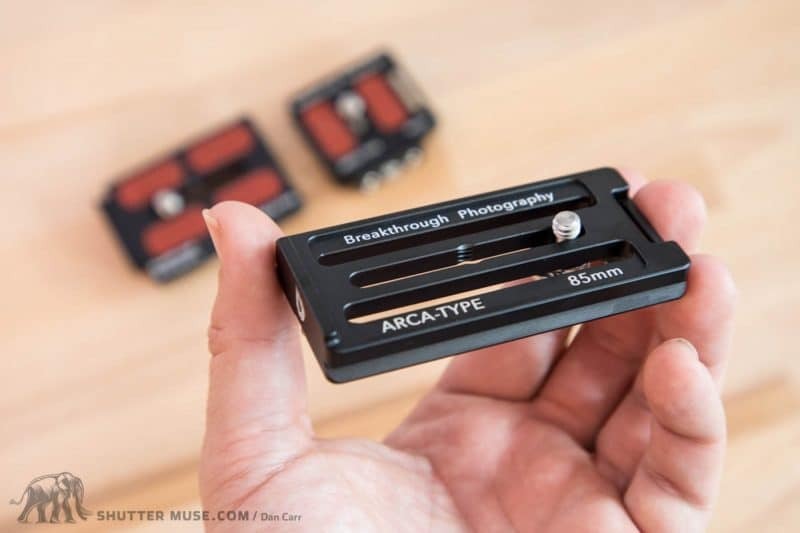 For this price, it’s just a great item to have as a spare in your kit, even if you have camera or lens-specific Arca plates from someone like Really Right Stuff. 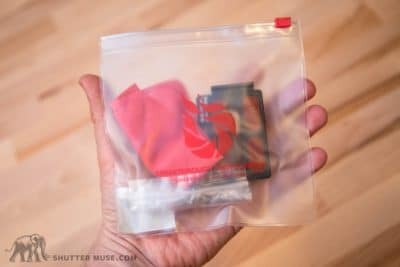 I have added mine to my permanent travel kit so I’ve always got a spare plate handy to use with rented gear, or just to lend to a friend that wants to use my tripod, or forgot their own plate. 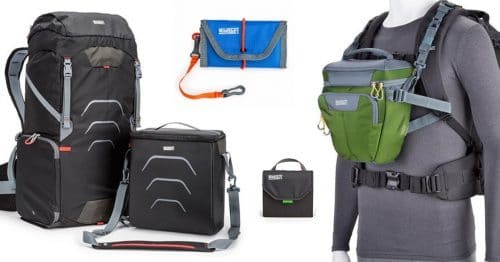 When it comes to camera gear, there’s few better ways to spend $15. As always, I appreciate it when you use the links on this page to make your purchases. I may make a small commission when you do so, and this all goes back into the site to allow me to continue to bring you free content. 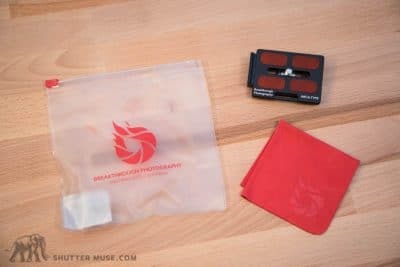 I purchased my Breaththrough Photography Quick Release Plate from B&H Photo for $15, but you can also find it on Amazon too. PS. Breathrough Photography also make what I consider to be the best third-party lens caps! 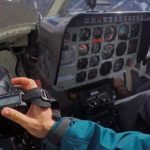 If you need to fill up your shopping cart to get to a free shipping threshold, you can’t go wrong with a few spare lens caps.